September 12, 2013 – Iowa Lakes Community College of Emmetsburg, Iowa, will host an open house and ribbon cutting ceremony at their new Swine Training Center on Thursday, September 19, 2013, from 3 to 4:30 p.m. Osborne Industries, Inc., of Osborne, Kansas, provided all the swine management equipment for the facility. Representatives from Iowa Lakes College and Brian Strobel, the Osborne Sales Representative overseeing the project, will be on hand to provide information and answer questions. Tours of the facility will be held and will showcase how students are learning the latest swine production trends at the college to prepare them for employment opportunities after graduation. The public is invited to attend this exciting event. For more information, contact Iowa Lakes Community College at 1-800-242-5108. 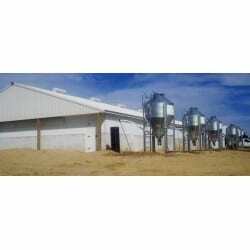 Osborne Industries is a leading manufacturer and distributor of swine production equipment located in Osborne, Kansas. For more information on Osborne Industries, Inc., call 1-800-255-0316 or visit osbornelivestockequipment.com.